Graphics can make the difference between winning and losing clients. Graphics can increase idea creation and innovation. Graphics can validate your solution (according to independent research). Unfortunately, many small companies and consultants have little money and time to design good graphics. Some are lucky to have any graphics at all (even clipart) to include in their presentations, brochures, and websites. So, how do you fix this problem? But beware. Reuse works well when done right. There are pros and cons to reusing graphics. It kick starts a marketing/proposal team or gets the team "unstuck." Starting with nothing is challenging. I call it “blank page syndrome” (BPS). But having a graphic from which to draw ideas, even one used in a previous presentation or proposal, is easier than starting from scratch. It saves time and money when done right. It leverages earlier efforts and institutional knowledge. Your company can get lazy (it is easy to say “good enough”) or trapped (keeping too much of the old/boilerplate content vs. using it as a starting point). Reuse can result in rewrites and late nights, if the old content misses the mark or doesn’t relate to the current project and causes confusion in the team. Your organization may not evolve and your marketing and proposal projects could lose their competitive edge. Excessive reuse results in no innovation and having no fresh ways to show your ideas and concepts, which can lead to others seeing your company as uninspired. Use Pareto’s Principal or the 80/20 rule. Eighty percent of your project is custom content and twenty percent reused and tailored content. Of course, every rule is made to be broken. If your projects are quick-turn and similar in size and scope, I recommend greater reuse. Implement a system to catalogue, search, and retrieve content—often referred to as a digital asset management (DAM) system. Most large companies use tools that can be customized for this purpose. For graphics, I recommend a solution with the ability to apply metadata (searchable keywords) like Extensis Portfolio.You can group graphics by theme to make it easier to find: organization charts, bar charts, stacked graphics, etc. Design for reuse. Develop graphics in a software package used by those on your team. Create layers within your files labeled for text, photos, boxes, lines, arrows, graphic elements, etc. Highlight the elements that require customization. Create a template indicating approved colors, logos, fonts, and any other design elements to keep design styles consistent and provide a starting point for designing graphics. Develop a good quality control process. For example, assign one or two other teammates to proof each piece before it is printed or uploaded online. The person designing the graphic should not be the one proofing it. Review and refresh your content often. As mentioned earlier, excessive reuse results in no innovation—and your audience may feel your company lacks innovation if they keep seeing the same graphics again and again in your materials. Whenever new graphics are created for a project, make sure they are labeled and copied into your database. If you find a certain graphic or style is being reused too much, remove it from the database or the company server or place it in a “retired graphics” folder. 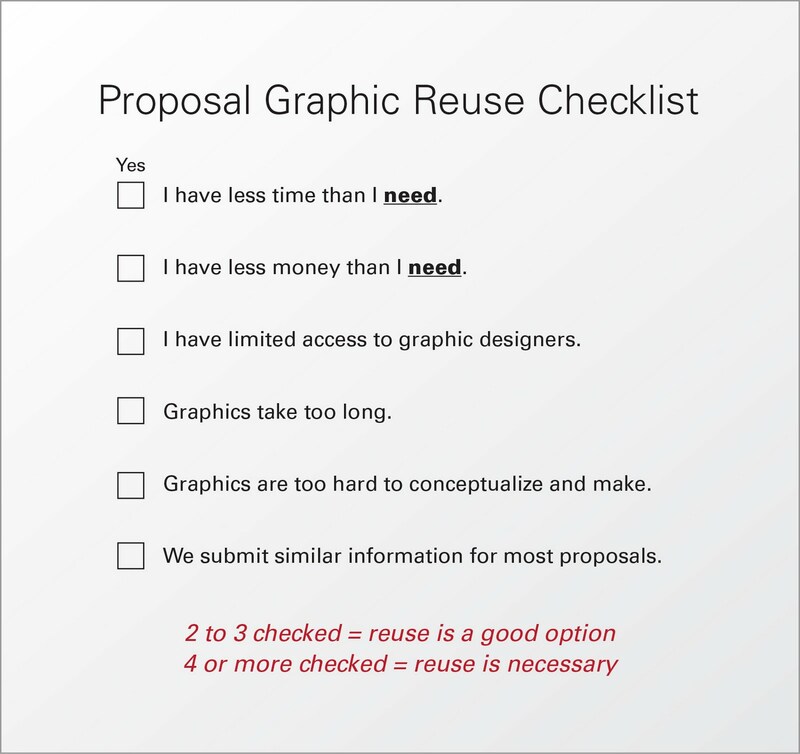 Reevaluate your need for reuse annually by using the reuse checklist and reviewing graphics needs with your team. In my experience, reuse is a necessary approach in our fast-turn business environments. The key to success depends upon a measured approach with everyone on your team working together. Want Clients to Choose You? Keep It Simple.